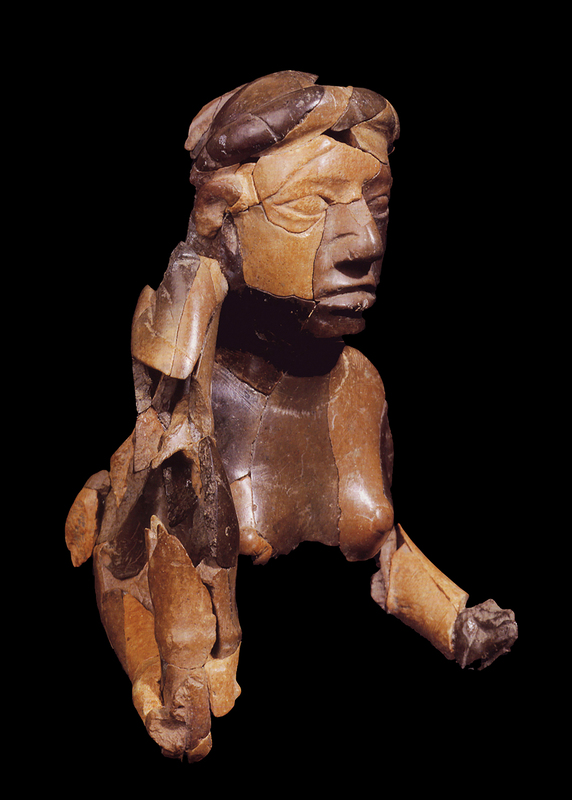 A new exhibit includes the upper torso and head of a red goddess sculpture, carved from stone and found buried at the ancient American Indian city of Cahokia. Note the serpent wrapped around her head. This artifact dates to the 12th century. 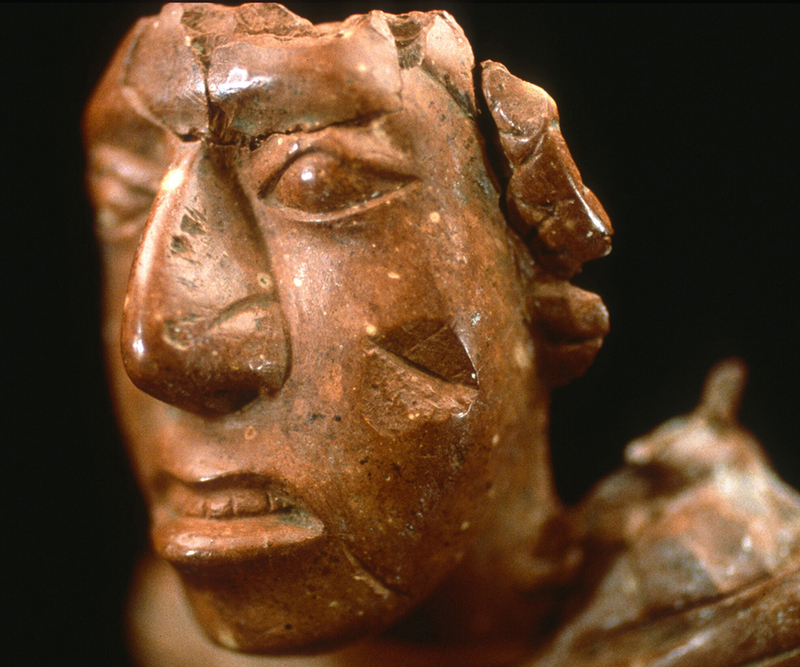 The face of Cahokian religion: One of the red goddess sculptures, also called the Birger figure, was carved from stone. 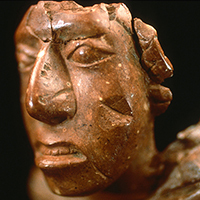 Archaeologists found it buried at the ancient American Indian city of Cahokia. CHAMPAIGN, Ill. — A new exhibit at the U. of I.’s Spurlock Museum offers a glimpse of the artistic and spiritual legacy of the American Indian people who built Cahokia, a great, thousand-year-old urban center on the Mississippi River. “Cahokia’s Religion: The Art of Red Goddesses, Black Drink and the Underworld” displays artifacts recently returned from the St. Louis Art Museum, including three of more than a dozen red carved-stone goddesses that the Illinois State Archaeological Survey found in our excavations of this ancient metropolis. 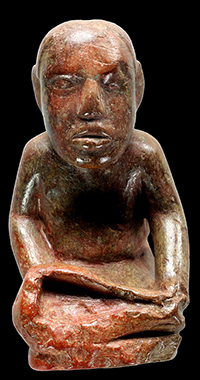 You can view these figures alongside other cultural objects that reveal a civilization’s core beliefs and values. The goddesses are modest, from a few inches in height to a foot tall. Ancient artists made them from soft rock quarried from sinkhole caverns west of the city of Cahokia. One goddess pours water from an ocean-shell dipper. Another digs her garden hoe into the back of a terrifying serpentine Earth spirit. A snake wraps its body around the head of a third, who in turn brings agricultural crops and fertility to the world. 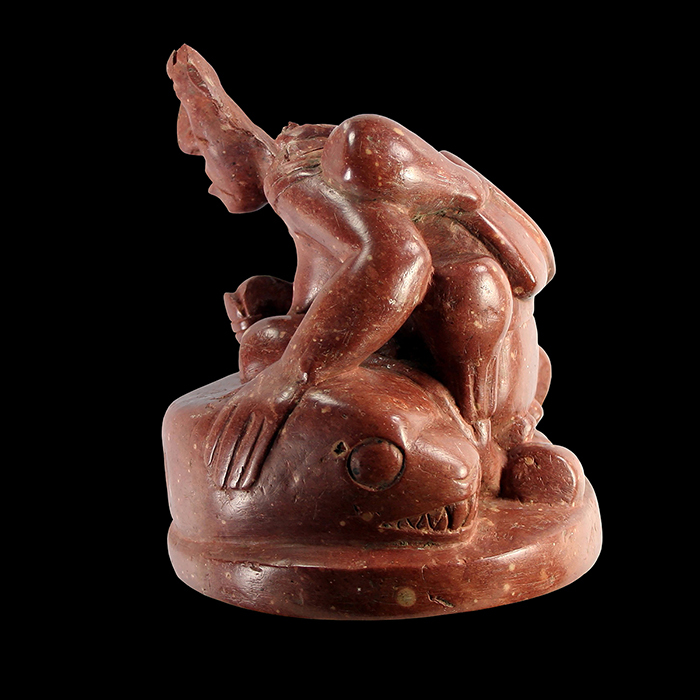 Another figurine from Cahokia holds a marine shell cup. Alongside these figures, our curators have placed cultural objects that tell the story of the Cahokians and their religious beliefs: mollusk shells from the Gulf of Mexico, beads from a necklace and chipped-stone hoe blades once used to till agricultural fields. There are pottery cups engraved with cosmic symbols and used to drink a potent tea, and ceramic jars carved with spiral designs and stained with the residues of Indian corn. Native American descendants and heirs of Cahokia today speak of powerful water, wind, earth and underworld spirits who intervene in their lives and shape human history. Our ongoing archaeological work saves from the forces of modernization that which we can of the legacy of the city of Cahokia. Everything we are discovering tells the story of a great people’s artistic and spiritual legacy that connects us all. 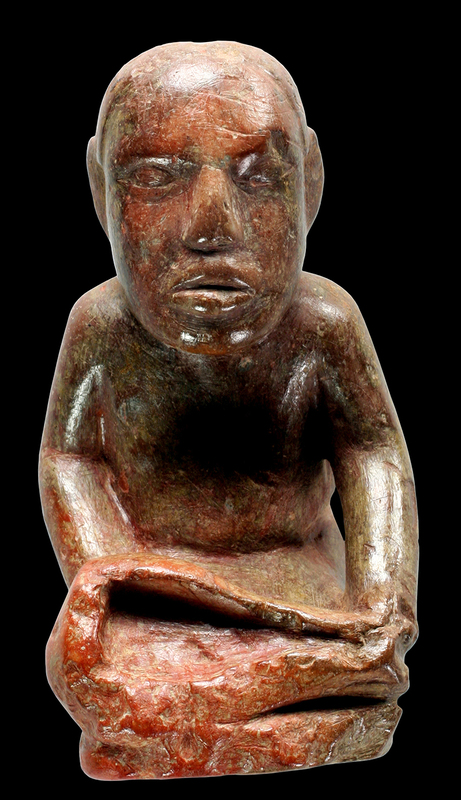 A Missouri flint clay figurine from Cahokia includes an earth serpent.